Illustration: All the illustrated plants were inspired by the actual plants that could be found in the bakery and it's neighborhood. Duration: The mural took a week from start of concept to completion of mural. Special thanks to Kitty and Biggy for being so accommodating and friendly throughout the whole process. Client: Hand painted mural designed and produced for the beautiful hotel + home the 51 Hometel based in Chiang Mai, Thailand. 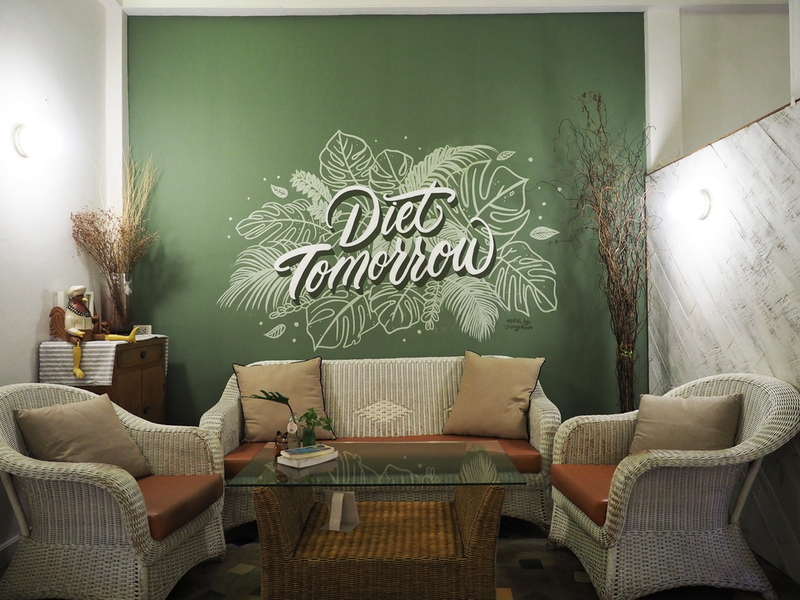 They were seeking for a mural that brings the outdoors indoors and highlight their plant-filled bakery. Phrase: They requested to keep the phrase simple and relatable for the Thai people. "Diet Tomorrow" was chosen as it's a little cheeky, nudging people to eat now, diet tomorrow. Looking to spice your wall up too?